In 2015 the world celebrated the 800th anniversary of Magna Carta, the charter in which King John agreed to new rules for his government. In the centuries since then, the document has come to embody the idea of the importance of rule of law and that even the power of monarchs had its limitations. However, one thing usually overlooked in the praise of this event is that Magna Carta was a failure. With his options dwindling, John agreed to peace talks, which were held at Runnymede, along the south bank of the River Thames. The negotiations began on June 10, and five days later an agreement was hammered out. There were 63 clauses that the king would have to abide to, ranging from “to no one deny or delay right or justice,” to “no town or person shall be forced to build bridges over rivers…” It was a sweeping repudiation of royal power, but even as copies of it were being drawn up throughout England, the king made it clear that he had no intention of following it. This article is the Introduction to Medieval Warfare magazine’s issue VII:2 – The First Barons’ War in 1215-17. Click here to learn more about the issue. 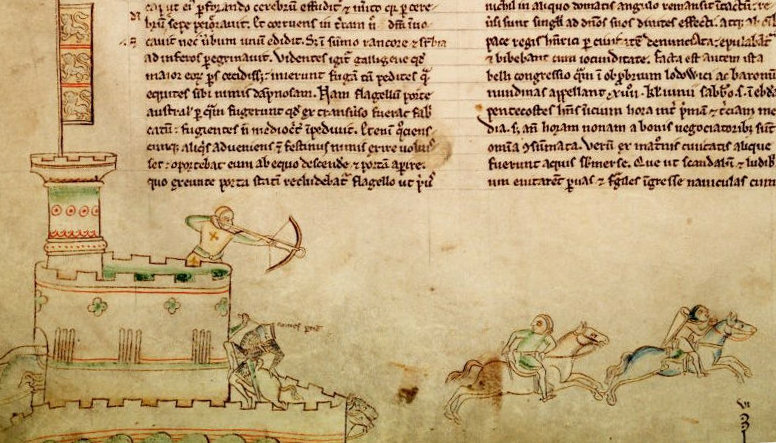 Before the end of the summer of 1215, the First Barons’ War had begun. The English king had cobbled together his few supporters with mercenaries from overseas, while the various rebellious barons sought to take control of their own castles. The first major action of the war was the siege of Rochester Castle, a strategically important fortress. Our first article, by William E. Welsh, describes the bitter fight for this castle, where both the attackers and the defenders earned praise from the chroniclers. If John was pleased by his success at Rochester, his happiness would be short-lived. The rebellious barons were able to convince Prince Louis, the son and heir apparent of King Philip II of France, to support them and become their King of England. Louis would first send reinforcements and then arrive himself on the island. In the spring of 1216, Londoners were celebrating the prince’s entry into the city, and much of the southeastern part of the country was under his control. The entire war is too large to cover in just one issue, with many of the smaller clashes taking place throughout England. For instance, there were the actions of Willikin of the Weald, a minor nobleman, who gathered a band of archers in Kent and Sussex and made ambush-style attacks against the French soldiers. Some scholars believe he might have been the basis of the story of Robin Hood. This issue will focus on the two most important military events of the war – the Siege of Dover and the Battle of Lincoln. The first was a long-lasting affair, in which the remaining royalist supporters held out against Louis. The second happened quickly, thanks to the bold (even rash) actions of William Marshal. To tell the stories of Dover and Lincoln, we are pleased to have Catherine Hanley and Sean McGlynn, both of whom have recently written books about the war. King John would die, not from peaches but probably from dysentery, on October 19, 1216. While some might think this would have a been disaster for his cause, it turned out to be the best thing that could have happened. Many rebel barons no longer saw a reason to continue to fight – John was their enemy and he was now dead. His son, Henry III, would be king, and he was only nine years old. Having a young boy on the throne was considered ideal for the barons, a better option than having a French prince.